With the endless media reports and the countless number of complaints and support emails we get from so many victims of abuse that are or were involved in one institution or another, whether it be a University or a religious organization this article is spot on! Joe Navarro is a former FBI Counterintelligence Agent and is the author of What Every Body is Saying. 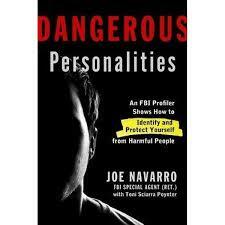 Also Author of: Dangerous Personalities: An FBI Profiler Shows You How to Identify and Protect Yourself from Harmful People. He is an expert on nonverbal communications and body language. "Predators, especially smart ones, go into professions where their victims will be easy to access. In other words, they count on institutions, to wit: the Catholic church or a university as in these cases, to attract and corral the victims for them—thus making predation easier and more plentiful. Yes, that is how predators think, I know, I have interviewed them. This is what institutions fail to get." And not only will institutions protect the predator, they will do the dirty work by questioning the veracity of victims or their memory, or worse, they may decide to just silence the victims. As unctuous as that sounds, that is exactly what they do. Institutions and enablers culpably embolden predators and so predators continue to do more harm. Sexual predators are aware that people are forgiving and that there will be those that will side with them no matter what they do – no matter how ugly the facts. So not only are they negligent, most institutions are reluctant to recognize that they may have hired or are associated with a predator. As if their institution were somehow immune from these individuals. No institution is immune. The question is, are institutions willing to acknowledge even the possibility? Most I assure you are not." We hope you found this information educational and please share it with others to help raise much needed awareness. Emotional Trauma - Can We Ever Recover?